Gelatin is the protein that gives bone broth its thick, velvety texture, and also the reason for many of its joint-healing and gut-soothing health benefits. But did you know that it’s also the magic behind commercial Jell-O desserts? Stir it into a room temperature liquid and pop everything into the fridge, and watch as it sets into the familiar quivery solid. This opens up a world of opportunities for healthy Paleo treats that you can make with combinations of gelatin and fruit. For this recipe, I haven’t specified anything at all; use any type of juice and fruit (or your favorite combination). Just make sure that whatever you get, you check the label for added sugars or anything else that doesn’t have a place in a Paleo diet. If you’ve never bought gelatin powder before, you can usually find it in the baking aisle, somewhere near the pie fillings: it’s a rare example of something actually good for you hiding in the middle aisles of the grocery store! These gelatin treats are delicious enough to eat just for dessert, but because gelatin is healing and soothing, they’re also perfect for anyone with a stomach bug. Replace a popsicle full of sugar water with a homemade bowl of “Paleo Jell-O” for something that not only tastes good and goes down easily, but will actually help your body fight off whatever’s got you down. SERVES: 4 PREP: 3 h. COOK: 5 min. Heat 3 cups of the juice until almost boiling. In a bowl, combine the 1 cold cup of juice with the gelatin powder and mix well. Add the hot juice to the gelatin powder and mix well again. 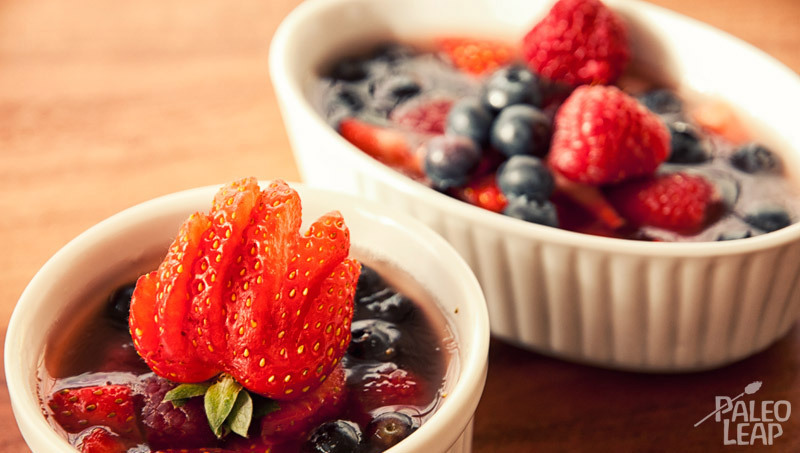 Pour into a pan and add the fresh fruits. Place in the refrigerator for at least 3 hours, or until firmly set.